The music program at SAS provides opportunities for students to perform vocally and instrumentally while becoming proficient in theory, sight reading, and music appreciation. Middle school music classes help students learn to sight-sing, read rhythms, have correct vocal production to maximize their abilities, study music theory, and how to be a member of an ensemble. Students will learn key and time signatures as well as musical vocabulary. 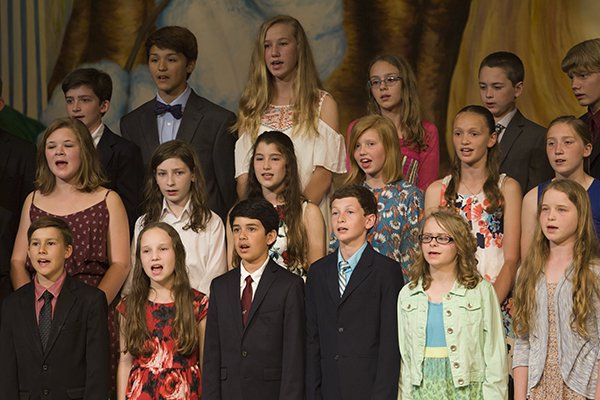 The sixth and seventh grades sing a variety of secular and sacred repertoire in two and three part harmony. Each section of eighth grade comprises a hand bell choir. This is a year long adventure in sight reading, technique, and ensemble playing. Upper School students may take choral or instrumental classes as well as participate in varied special performances throughout the year. Private lessons are readily available for those who wish to take voice, piano, percussion, strings, winds, or brass. Creative Expression assemblies and Open Mic Nights afford chances for musicians to perform works of their own choosing for a wonderfully receptive audience. SAS students play with the Sewanee Symphony Orchestra which gives two performances a year and rehearses weekly throughout the school year. Transportation is provided for private lessons as well as for orchestra rehearsals. All music students participate in two yearly concerts in McCrory Hall for the Performing Arts and are encouraged to be a part of the annual musical. These performances are well attended by parents, faculty, and the Sewanee community.